Exhilarating is the word that best describes Barca Academy’s relationship with Bengaluru. Between 2013-2015, Barca Academy, formerly known as FCBEscola India, held camps in Bengaluru, training 1,500 young footballers. The spontaneity and enthusiasm that Bengaluru exuded towards football has led Barca Academy to launch football schools in the Garden City. Barca Academy will be starting the football schools from November 19, 2018 at two locations – Trio World Academy, Sahakar Nagar and Ecumenical Christian Centre, Whitefield and will be catering to over 1,000 budding footballers. The two permanent bases of the Barca Academy in Bengaluru will be under the supervision of Technical Director Jordi Escobar and he will be leading a team of 12 coaches. To provide comprehensive year long training to young footballers, thrice a week classes will be held in each centre. 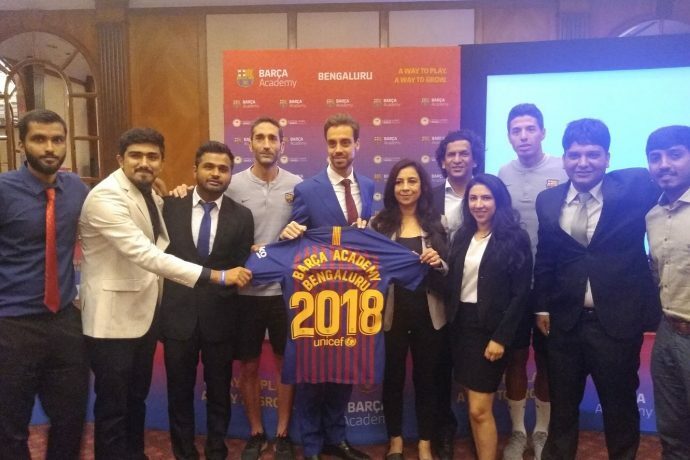 The launch of Barca Academy in Bengaluru comes at a time when India is preparing to host Barca Academy Asia Pacific Cup 2019 in January 2019. On September 29, 2018 FC Barcelona Legend and former Argentina World Cup player, Javier Saviola announced that Barca Academy, Gurugram will be hosting the Asia Pacific Cup 2019, the premier intra Barca Academy. Barca Academy’s training methodology nurtures talent while providing holistic development to the youth. More than just learning to play football, the academy instils in a youngster the Barca values of camaraderie, friendship, trust and loyalty. The program in India mirrors these values and has taken the lead in providing many Value added services like Fitness & Conditioning, Health & Nutrition, Physiotherapy etc. The children and many times even their parents are benefitting greatly form these activities that are learnings for life. The fact that Barca Academy is one of the best youth development programs in the world, coming from a club that has produced talents like Messi and Iniesta from its own stables, is now bearing fruit in the Indian environment as well. Be it the representation in India’s U17 World Cup Futsal squad or in Haryana and Delhi Sub-junior & Junior State teams or in the Delhi football league representing various clubs the Barca Academy trained players are beginning to make a mark.